The Up/Down is innovative and stylish in design. The top surface is an extrordinary mix of stones and acrylic resin that has a scratch-proof matte surface. Other tops are available in colored float glass. The frosted glass door slides up and down allowing for functionality and design. Complement the look by adding a matching shelving unit. 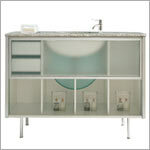 All vanity and shelving units are available in white lacquered wood or wenge wood.